Dear readers, we are distressed to inform you that the leadership team of Gilead Sciences in Australia appears to have gone missing in the wilds of “overseas”. After michaelwest.com.au touched base last week to discuss the tax affairs of the giant US pharma company in Australia, spokesperson Andrea said the team was overseas and unable to be contacted. Days passed. We expressed concern to Andrea on Friday and yesterday about Team Gilead and inquired as to their whereabouts and well-being. Alas there was no word. They were still completely uncontactable … overseas somewhere. Did they not have mobile phones and broadband overseas? Surely, they must be in an exotic locale. Could it be the Sahara Desert? Unlikely; mobile communications in Chad and Niger are slow and patchy but the internet is slow and patchy in Australia too. In fact it was very slow and patchy at this very desk last night. Perhaps the G-Team was climbing Mount Everest and therefore unavailable for comment because there was no mobile reception in the Death Zone. No, we can rule that out. We soon discovered that hanks to Huawei and China Mobile – Everest is now wired all the way to the summit. If it were another season, it might be plausible the Gilead leadership team was uncontactable in Antarctica. There is no mobile reception in Antarctica but travelling there in winter is impossible so we scratched Antarctica from the list. 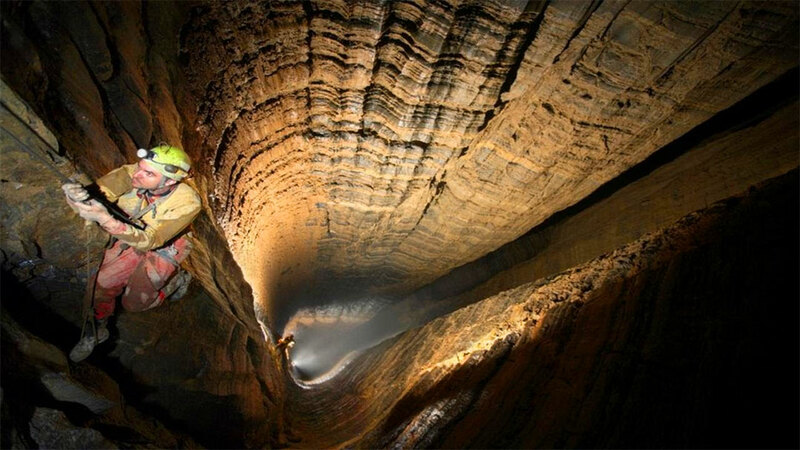 That left one place on the planet: the Grubera Cave in the Republic of Georgia, The deepest cave in the world. According to a BBC report, The last places on Earth without the internet, it would be difficult to get mobile reception in the Grubera Cave, particularly in the lower echelons as, at a depth of 1.71 kilometres below the surface, the Grubera Cave is a very deep cave. Could it be that Gilead directors Mr R Hetherington, Ms R Washington, Mr B Pletcher and Dr R Ertl – along with Gilead’s chief financial officer and other executives – are on a speleological expedition beneath the earth in Georgia, Stalin’s old stomping ground? The uncomfortable truth is we just don’t know and so our thoughts and prayers go out to the friends and family of Team Gilead at this difficult time. There is one other possibility. It may be that Team Gilead is not really uncontactable but rather … hiding. We have discounted this possibility as it would suggests sly behaviour. Looking at the company’s financial statements however, sly and foxy behaviour cannot be ruled out. Like other Big Pharma companies, Gilead receives enormous taxpayer subsidies via the Pharmaceutical Benefits Scheme (PBS) but then pays a pittance in corporate income tax, funnelling its profits from Australia offshore. Although Gilead booked $2.3 billion in cash receipts from its customers in Australia last year, it paid just $2.8 million in income tax and over the past six years, tax as a percentage of revenue is 0.82 per cent – correct, they are paying less than one per cent of their sales – after billion dollar subsidies via the PBS. This response neatly reflects two points: 1. there is no accountability by multinationals and their advisers, and 2. the real directors, “shadow directors”, are offshore pulling the strings and so the local entity should be taxed as such, treated like an agency rather than a body corporate. Postscript: Gilead was contacted on July 6 with a list of questions. It failed to answer every question and responded with an irrelevant statement. 1. Can you confirm the parent company of Gilead Sciences Pty Ltd is Gilead Sciences ltd or Gilead Sciences Ireland UC. 2. Please explain how you recognise cash receipts from customers of $2.3B on sales revenue of $483m? 3. Can you explain how payments to suppliers and employees are $1.6B when costs of sales and employee benefits are only $441m? 4. The average salary is $230k according to your accounts. Please explain why it is so high? Is this below or above industry average, or a mistake? 5. P19 of 2016 referred to a ‘provision for rebates” of over $1b but the balance sheet only shows provisions of 1.5m. Please explain. 6. Do you have any financial assets at fair value through the P&L or available for sale as investments at year end? 7. Please explain why there is no allowance for doubtful debts on trade debtors of $385m. Are sales guaranteed? Please attribute this statement to a spokesperson from Gilead Sciences, ANZ. Gilead Sciences, Inc. is a research-based biopharmaceutical company that discovers, develops and commercialises innovative, life-saving medicines in areas of unmet medical need. Gilead’s most recent PBS listings are for new hepatitis C treatments. The Australian Government has taken a world-leading approach to providing broad access to these medicines, which has the potential to eradicate hepatitis C in Australia.Gilead works closely with the Department of Health to reach agreements that provide access to its medicines. As is the case for many PBS listed products, some medicines are listed on the basis of complex, multi-year funding arrangements. These agreements may include rebate and reimbursement schedules, and the details of these arrangement are confidential. It is not accurate to draw conclusions about financial information and taxation arrangements based on PBS sales of Gilead medicines in Australia.Gilead Australia takes its tax obligations seriously and determines its tax liability in accordance with Australian tax laws, with tax calculated on taxable income.